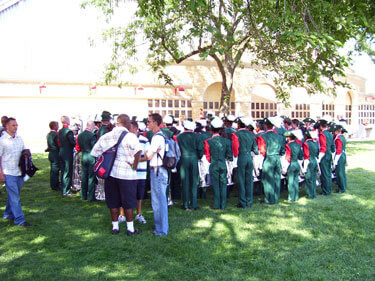 Bobby Lindsey, a 2006 Vanguard Cadets parent, sent this picture. Here's a shot of the 2006 Santa Clara Vanguard Cadets moments after leaving the field for their final performance at Camp Randall Stadium in Madison, Wis., on Aug. 12. As some are aware, it is tradition for the Vanguard drum majors to give the command, "Vanguard, feathers up!" just before entering the field for competition, at which time the corps members, with the exception of bass drums, simultaneously raise the feather on their trademark Aussie hats. Seen here with their feathers down for the last time in 2006, the corps brought closure to a great tour and another great season. My son Brandn marched as a member of the 2006 Vanguard Cadets, and I had the opportunity to volunteer on the transportation team for the long tour to Madison. The Vanguard organization is everything that one may imagine, oozing with class and tradition at every level!